Indiana State University will once again host the "Fill the Cart" drive to collect items for the Terre Haute Humane Society animal shelter. The large, dark green metallic cart that toured several campus buildings last December will once again be out to accept items to be donated to the animal shelter. The nonprofit that works to rescue animals such as cats and dogs uses a variety of items to operate year-round. The shelter works with Terre Haute and Vigo County authorities with animal control, though they do not receive any other government support. "The good thing with the list is that folks can just bring items they typically have at home anyway," said Bradford Sims, dean of ISU's College of Technology, who partnered with the Humane Society for the "Fill the Cart" drive. "There might be something they have that may not be that important to them, but it can really help the shelter." The shelter needs an array of items to operate, from flea and Heartworm medication to office supplies and newspapers. The shelter even can benefit from used bath towels, and volunteers bathe puppies and kittens with Dawn dishwashing soap. The shelter also uses significant amounts of laundry detergent and bleach for the dozen loads of laundry that need to be done daily. "Think about doing 12 loads of laundry at your house," said Maggie Wheeler, outreach and education coordinator for the Terre Haute Humane Society and English instructor at ISU. "That's a lot of laundry." The shelter typically needs to replace several washers and dryers through the year, as people are frequently doing laundry. "We get a lot of donated linens and blankets and things, and we use those for the animals, but then they have to be cleaned," Wheeler said. "We don't just throw them out. We wash them and reuse them, so everything has to be washed in bleach. That's what kills a lot of diseases that can be spread." The green cart collecting goods will be stationed in different campus buildings over the next several weeks for people to donate items. The Humane Society also accepts gift cards from different stores, as the shelter can frequently run low on various items throughout the year.The shelter recently ran low on office supplies, which are used in processing adoptions and other logistical needs. The shelter can run out of supplies quickly, Wheeler said. Last year, the Indiana State community donated more than two cartloads of items to the Humane Society. A large van was filled to capacity with the items. "I think this year will be even more successful because people ... remember when we did that last year," Wheeler said. 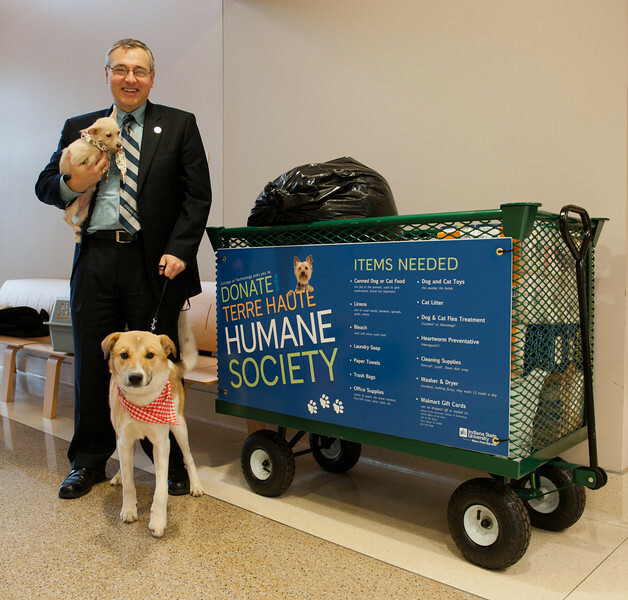 Photo: http://isuphoto.smugmug.com/photos/i-gZXzstX/0/L/i-gZXzstX-L.jpg (ISU/Tony Campbell)Bradford Sims, dean of the College of Technology at Indiana State University, poses with two dogs from the Terre Haute Humane Society last year next to the cart used for the "Fill the Cart" drive. In the campaign, members of the ISU community donate basic goods the shelter needs for animal care. Volunteers always take care of the animals, even on holidays such as Christmas and New Year's Day. ISU will once again host the "Fill the Cart" drive to collect items for the Terre Haute Humane Society animal shelter.